comguiWhat is th file size?Looks like the conversion process was not successful.Can u try once again.Or can u try image creation from cli? I have the same issue. I cannot delete images after they are uploaded from within the CE interface. For those who are trying the same the instructions above work on the CVM not the host. I have the same issue. I am trying to upload ISO image directly from my local download. After image upload to Prism central, the status is showing INACTIVE in Prism element. Any idea how to make it active. WHAT? How can you assign it to a VM when it is inactive? This answer is clearly just wrong. Yes you are correct @thadmccall my answer was absolutely as you put it, "clearly just wrong". I however had been using NUTANIX and Prism for less than a week and was attempting to be helpful. Firstly let me thank you for pointing out my error. Secondly let me point out yours... Instead of responding to a post with a simple 'WRONG' stamp, maybe in the future you could provide a more constructive answer to the question and less of a troll response. I have the same problem. I have upload some Images and all are remain Inactive. I have test it with all Browsers and Image formats. All are still in the same status. Is there any cli command to convert the Image manualy? I am having the same Problem with Images remaining in an "Inactive" state. I have two Nutanix Clusters connected to a PRISM Central instance. I uploaded an ISO-Image via PRISM Central. The Upload was successful but the Image is usable on only one Cluster. How do I get the Image "replicated" to my second cluster. Uploads direktly on Prism Element are not possible when the Cluster is registered with Prism Central. 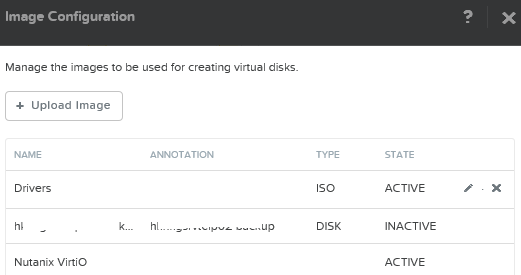 Attaching the ISO to a new VM is not possible on the Cluster with the State "Inactive". I tried attaching the iso via Prism Element and Prism Central while creating a new VM -> no Image to select. We are having the same problem. Import from Prism central, cluster1 inactive, cluster2 active. We are using AOS 5.5.7 and PC 5.9.01. Hopefully this gets fixed in a later release. If we have CENTRAL PRISM installed and configured against CLUSTERS, we must do this in PC, not in the CVM of the remote cluster.